2 groups down and 4 more to go. 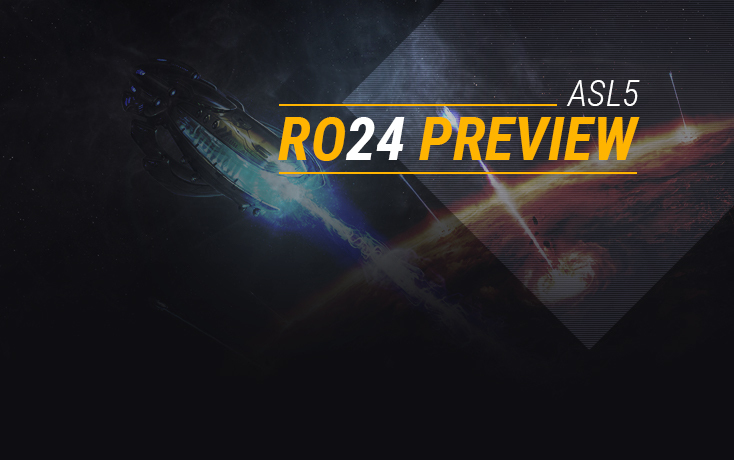 The Ro24 has delivered so far with some mesmerizing gameplay. 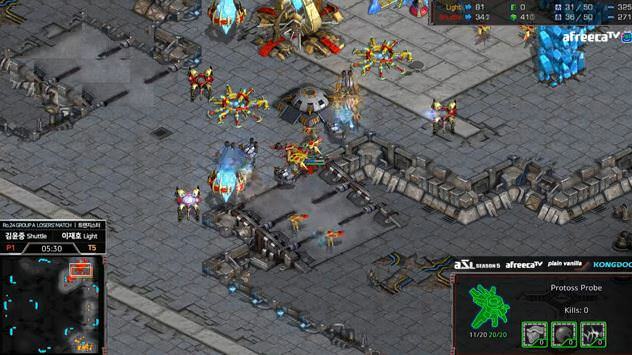 In particular, Sparkle has allowed us to witness mass air battles and the usage of units such as dark archons that rarely made an appearance in the later games of the KeSPA era. We've also seen some players brilliantly taking advantage of map architecture on Transistor to their advantage. Group A featured Shine, Light, Sky and Shuttle. Shine's bag of builds seem on display as he disposed of Light and Sky in quite the cool fashion. Shuttle advanced second after facing elimination head-on and rallying back. His play may have looked weak, but he's certainly going to dial it up in the next round! In group B, both Stork and EffOrt advanced after some hard fought battles. Horang2 also made quite the show in his first appearance in ASL by playing a fantastic game on Sparkle. Definitely watch the vod if you get the chance, you won't regret it! 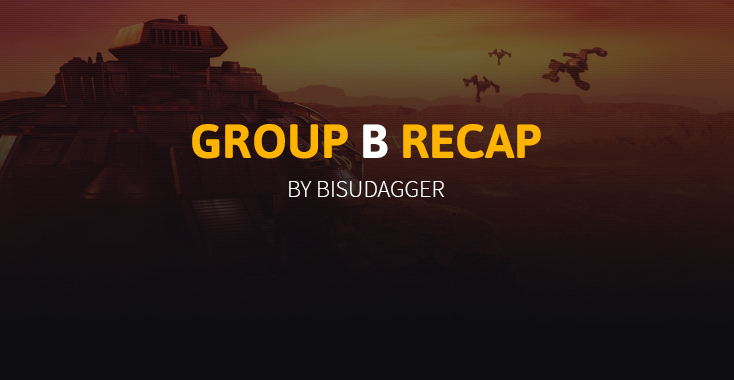 Read the recap of Group A and B by Ty2 and Bisudagger respectively for more information! 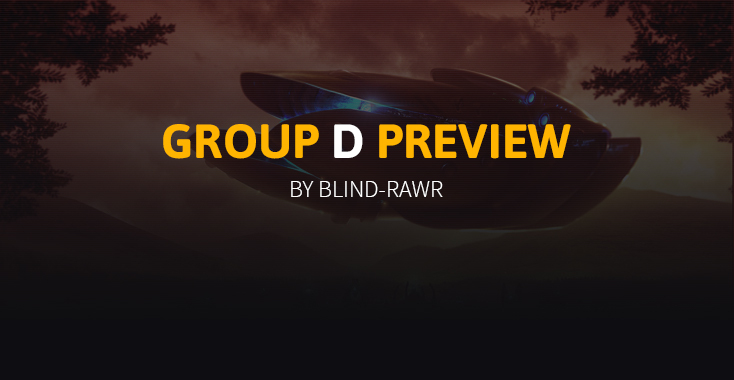 Group C featuring Best, Mind, Calm and Rush is set to start in and has been previewed by Ziggy while Group D featuring Last, Mong, Snow and Where, previewed by BLinD-RawR will start 2 days after. Let's get hyped! The ASL Ro24 debuted with the first island map in years. The first round of matches to showcase the map were Sky vs Shuttle and Shine vs Light. Sky, known for his wacky PvZ builds, but otherwise an unknown has showed his ability to compete with the ex-pros. His tenacity and preparation for the map shone through in an all-you-can-offer display of Sparkle's PvP. Spawning in the bottom right is Sky, versus Shuttle on the the opposite side in the top right. Shuttle opens sair reaver while Sky opts for speed shuttles. The initiative for aggression is set as both players take their 3rds. Sky shoots first, attempting to levy his ground army advantage in the hope of averting the watchful gaze of Shuttle's corsairs. One drop lands at Shuttle's third, but the second is met by a line of cannons at Shuttle's natural. Sky's attacks having run their course put Sky at the mercy of Shuttle's attacks. Sky faces the loss of his natural repeatedly as more back and forth battles occur at each others' islands, both players hurriedly levying reinforcing units into the fray of battle. DTs are dropped to take advantage of the lack of observers, and reavers constantly abuse their higher range over cannons. In an exemplary display of crisis management of both players, Sky manages to pull ahead with a fourth base, denying Shuttle's own. The game explodes into the stuff of dreams for theorycrafters as Dark Archons with mind control are used to take control of opponents' incoming shuttles! Shuttle now on the backfoot opts for an all-out assault off of the 3 base economy he has left, but eventually becomes whittled down by Sky's superior economy. This PvP had it all; dark archons, DT's, reavers, but in the end Sky had the mental fortitude to pull ahead of Shuttle in the scrappiest of games. Shine, our beloved bag-of-builds Zerg is an absolute crowd pleaser when it comes to creativity, and Sparkle presented a more than ample stage for him to perform on. Light, a Terran once known for his unparalleled raw mechanics stood awkwardly juxtaposed to the map as Shine reclaimed his rightful throne as a top contender. The game begins with Shine spawning in the top right, and Light spawning in the bottom left. Already, Shine takes the no rush 10 minutes to heart, taking 4 hatches before pool, a truly naughty display. Light does likewise with a fast expansion. Shine getting fat off of minerals smoothly transitions into hydra drops. In a journey that rivals the Mayflower, the Overlords whisk and weave their way past Light's wraiths to land ho in Light's natural to decimate Light's economy. Light responds in kind as two dropships attempt to pick off Shine's 3rd. A back and forth fight takes place, heightened by picking off the connecting Nydus ending the lifeline of Shine's 3rd. Light in a strategy of search and destroy attempts to shut down Shine's new base at a main which is thwarted by a gang of hydralurk. The game continues to spiral out of control as they trade blows; Shine using a muta switch to kill off Light's 3rd, and Light's dropships honing in on scourge like turret missiles. 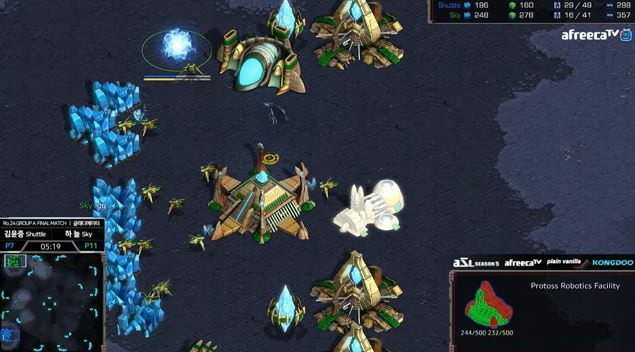 As Light's initial aggression runs out of steam, Shine's subsequent counter drops prove too much as ultraling defiler squashes the Terran resistance and the entire map lies in Shine's grasp. Resigned to his fate sitting on his first two bases, Light gg's. Shine remarked earlier that Sky and him think alike in the variety of builds they implement. In a game of wits behind two alike minds, the map was on full showcase. Spawning in the 7 o'clock is Sky, and spawning in the 5 o'clock is Shine. Sky opens 2 gate versus Shine's 12 hatch. Running away with what damage he caused from forcing Shine to make lings, Sky takes an expansion without a single drop of blood. Shine clearly has other plans, and takes the game to Sky with a speedling all-in complete with a drone drill, July style. Sky has prior notice though thanks to a sneaky probe. However, Sky skipped a forge for a fast Stargate making the situation dicey. Shine, making his move, has zerglings move in from both ramps to encircle Sky's meager forces. Sky having immaculate micro manages to trade armies with Shine, left with only a few zealots. 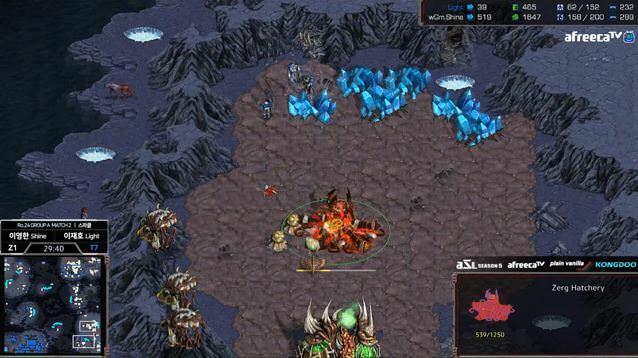 Shine's onslaught shows no sign of relenting as he breaches the first line of defense. He abuses the lack of cannons as his zerglings attack the main, kill off warping in cannons, and pick off probes. Sky with no visible recourse goes on a wild goose chase before losing all of his probes. Shine in dominating fashion shows the people what an ASL finalist is made of! 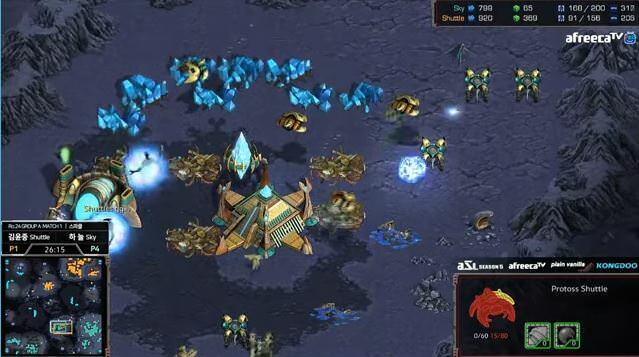 Light, spawning in the 5 o'Clock, inspired by Shine's shenanigans attempts a 3 rax SCV drill to counter Shuttle's nexus first. Shuttle though, ever so wary spots a suspicious line of SCVs making a beeline to his base, prompting the red alert. A clash of probes and SCVs, tickle beams to fusion cutters, pave the ramp with blood and bolts as the marines and dragoons watch in awe. The marine wave is eventually halted by the dragoons and probes, leaving a bunker as empty as Light's chances of winning. Light was visibly, strangely complacent with his short run as his face wore a plain expression. In the final match to decide who advances, Sky spawns in the top left and Shuttle spawns in the bottom left. Sky opens 3 gate, hoping to catch Shuttle off guard and abuse the inverted ramp. Shuttle on the other hand has different plans, ever so cleverly predicting Sky's sophomoric strategy, countering with the ever so skillful DT rush! Viewers can only watch in horror as fate unravels. Sky's attack is dwarfed by the ever-present lack of detection as Shuttle's DTs run rampant. Shuttle advances. 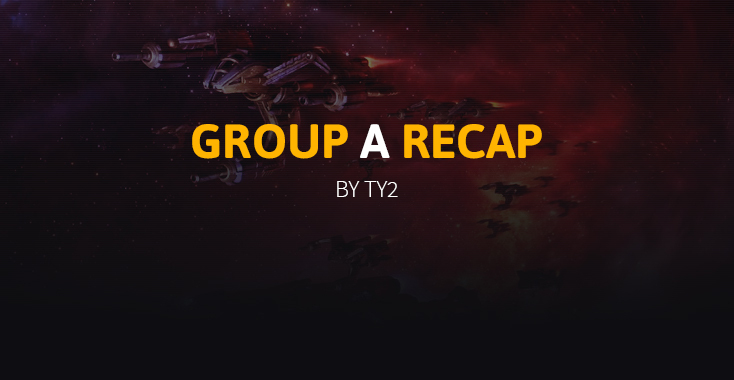 An all protoss group that contains Stork, Horang2 and IAmMang with EffOrt being the lone zerg. Who will be the first to fall? EffOrt faces off against Horang2 to start off group B. Horang2 is new to the ASL party, but looked immediately comfortable to be back on the main stage as the game proceeded. Horang2 starts off by quickly teching to shuttles, so he can put a probe on an island expansion and allow him a chance to grab his third base quickly. EffOrt scouts well and is aware of this early third, so he pushes his tech toward speed and drop overlords. At around the eight and a half minute mark, EffOrt ferries hydralisks over to Horang2’s base and drops them beside the Nexus. However, Horang2 had many cannons and reavers at the ready to quickly shut down the aggression. Another drop attempt from EffOrt fails as he tries to pressure the natural base. Cutting his losses, EffOrt packs it up and heads home to recuperate. Horang2 was left with great gas production and continues to pump out corsairs to control the skies. EffOrt responds by teching up to Greater Spire. The players transition into the late game where EffOrt hopes to start gaining an advantage. This would soon be futile as Horang2 proceeds to lay on the harassment with corsairs and reaver drops. Even though EffOrt brilliantly researched and employed burrow of his workers at the right time, Horang2 was able to do far too much damage and won himself the first match. This game was a total Fhat the Wuck. With PvP at play, fans and casters were eager to see how this would play out. Both Stork and IamMang shared the same agenda to go mass corsairs. It wasn’t far into the game before this PvP looked eerily similar to Phoenix vs Phoenix PvP battles in SC2. Perhaps this is why there has been a 15 year absence of island maps. Even though the ground game consisted of single zealot drops denying bases, the air strength of each player continued to grow rapidly. Corsair upgrades were consistently researched and even dweb was added to the mix. Stork employed dweb at strategic times to gain economic advantages over IamMang. With Stork able to out expand his opponent, it came down to his dominant carrier count. In a final galactic showdown, a blinding stream of interceptors engaged each other as Stork took his victory. Stork quickly gets back into battle mode against match 1 winner, Horang2. Eager to take an economic lead, Stork opts for expand first. Horang2 hops into action and immediately responds with a manner pylon. The situation becomes more urgent as another manner pylon is put down along with a shield battery. Horang2 attempts to put Stork in a bad spot with zealot harass, but is unable do much damage. Stork’s impeccable micro and the long travel distance for slow zealots allows Stork to hold. Horang2 gives himself enough breathing room to expand to his own natural. At this point, the game starts to even out. But, Horang2 is an opportunist and is eager to try and expose Stork once again. Horang2 techs to speed shuttle quickly and commits to a dual shuttle drop. It was a disaster. Stork was perfectly prepared and takes minimal damage. This failure puts Stork heavily in the lead. Stork responds with a series of successful storm drops himself and Horang2 has a weakened economy. The final battle follows moments later where Stork’s superior numbers overwhelms his opponent. Stork advances to the Round of 16! EffOrt finds himself in the losers match with two protoss games ahead of him. Starting with his match against IamMang, he chooses to do some harassment by opening with a gas steal. This attempt to slow down corsair tech proves effective. IamMang pushes across the map with his corsairs followed by DT tech, but EffOrt is already in place with many scourge. 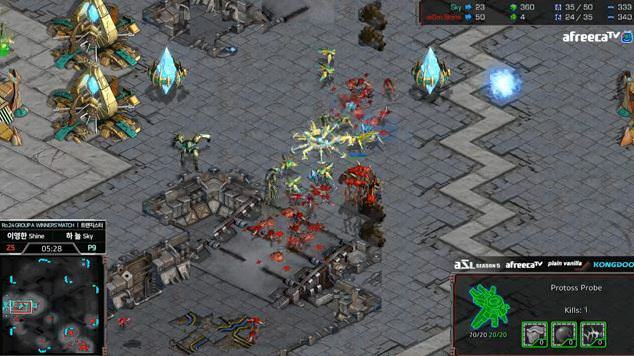 The corsair ships are torn from the sky and the protoss army is severely weakened. IamMang responds with a ground assault of zealots and multiple attempts at DT harassment. EffOrt defends each attack swiftly and effectively. Looking like his champion caliber self, EffOrt moves in with his mutas to start sniping high templar. Behind this maneuver, EffOrt brings forth multiple groups of hydras to tear down the cannons at IamMang’s third. EffOrt’s victory here puts him in the final match of the day. EffOrt has his revenge match against Horang2. The game starts off normal as EffOrt shows his transition to lair tech. Horang2 scouts with his probe, but loses his ability to scout as EffOrt chases the probe away. The lair, which was close to being completed, was then canceled. Instead, EffOrt goes for a hydralisk bust. Horang2 does not have enough cannons to hold and taps out. EffOrt advances to the round of 16! Best's performance has been on a downward spiral since ASL3. The former SKT T1 protoss lost to Sea 2-3 in the semifinals of ASL2, got eliminated by Soulkey in the quarterfinals of ASL3 and then failed to make it to the round of 8 in ASL4 after a weak showing in the round of 16. If the trend continues, Best might be hard pressed to deliver worthwhile results. Mind, on the other hand, has been performing rather well in sponmatches and most importantly, the KCM Legend series. The latter, however, does not give us a good measure of his Terran vs Terran prowess. To add to the uncertainty of Mind's current form in TvT, he has to go up against Rush on Sparkle. A loss in the opening match can certainly take a toll on a player's mentality, so should Rush manage to outsmart the winner of the first tourney in the KSL/ASL series, Mind might find himself in a tough spot. Rush upset Soulkey in the Seoul qualifier for ASL5. And if he can beat someone as good as Soulkey in a high-stakes situation then I'm sure he has a chance of making it out of this group. I do, however, think the only way to do that is to gain momentum by opening with a win on Sparkle and then following that up with a quick all-in on Transistor. Catching the other players off-guard on a map like Gladiator is out of the question, so trying to benefit from the unique aspects of the newest maps in the ASL might be Rush's best shot at advancing to the round of 16. Calm is the biggest mystery in group C. A trait that is both a strength and a weakness at the same time. Calm made a splash towards the end of the KeSPA era, when, at the height of his career, the former STX Zerg took first place in Avalon MSL in 2009 and then followed that up with three semifinal finishes in various other StarLeagues. He's disappeared off the radar for a while after that, not managing to deliver any worthwhile results ever since. But, he's been trying to qualify for the ASL for a couple of seasons now, finally making it into the main tournament of ASL5. I, for one, hope to see more of Calm in the future. Island maps are not particularly Zerg-friendly by nature. Even though the creators of Sparkle addressed the issue of Zerg players struggling to obtain sufficient gas to keep up with the remaining races, that might still not be enough for Calm to overcome Best. As for the other match, as long as either player does not take critical damage in the early game, I do not believe a checkmate situation is as easily forced as in any other matchup on an island map. Historically, Mind's ultra lategame TvT has proven to be better than that of Rush, so I suspect Rush's best bet is to try and end the game before the map gets cut in half. If my predictions are correct, the matchups on Transistor will be Best vs Rush, and Mind vs Calm. As I've said, Rush's best chance of making it out of this group is to try and finish the games as soon as possible. Whether that happens or not might depend on the spawns on Transistor. Hopefully for him, neither player spawns in the centre left. But that's a big if. A 33% kind of 'if'. Or something along those lines, I'm not good at math. Mirror matchups are always hard to call. Whereas, I genuinely think that with Rush's dropship control, he has a shot at taking down Mind on Sparkle. On the much more standard map that is Gladiator, the latter will have the upper hand. Experience will come through and in the end, the Power Rank will yet again prove to be correct. Best and Mind to advance to the Round of 16! Group D features Last, Snow, Mong and Where (aka MIsO) and another season where we ask ourselves will Where make it past his group? Well, lets find out. **Note: All numbers and winrates referenced are subjected to change as of writing this. Snow definitely got the group draw he wanted, with 2 terrans and a zerg. Fortunately, his zerg opponent is not by.hero either like last season. Snow has some of the best PvT right now and is also sitting at a cool 75.4% winrate against Terran in March for sponmatches, having a winning record against pretty much all his terran opponents except for Flash. Infact, he is 21-6 against Mong and while he and Last are often never on at the same time and rarely play against each other, they do have a 50-50 winrate against each other so far. It depends heavily now on how much Transistor will affect their meeting. Last was AlphaGo, a monster among men. Literally a machine, but these days its pretty obvious that he's becoming more and more human. Of course, he's still the 2nd best terran, but the gap between him and Flash has been widening ever since ASL2. That being said, having an above 50% win rate in all 3 matchups is a sign of a still solid player and opening up against Where is definitely an advantage for Last (the very same advantage he was handed last season too). If Last were to face Snow in the winner’s game, it’d be advantage to Snow, but should he face Mong, it's definitely to his advantage. It should be noted that Mong over the whole month has been massing TvP games non stop and has landed at exactly 50% winrate in the matchup (71 wins in 142 games). He's definitely working on his match against Snow, which also means that he is capable of pulling out a solid game plan against Snow on Sparkle. But, at the same time, Mong all but neglected his TvT which sits at 40% from a total of 30 games so far. This makes it seem like he might have prepared something for the map he might face Last on in secret, but his end game for the group seems lacking and would have to play it by ear. Where’s body of work post ASL4 has been his appearances at and winning in the Clash for Char weekly tournament series hosted by our very own Qikz. Beyond that, his sponmatch numbers against Koreans are pretty low, posting an overall winrate of 44.1% across all matchups. However, the number is only because of his ZvZ winrate. Unfortunately, with no other zergs in the group, his actual winrate looks a lot lower. Snow and Last to advance to the Ro16! I'm not sure what KCM legend Series you are talking about, but Mind's last KCM Matches was back on October 12th where he lost his only game to Shuttle. Also From May 26th to August 29th, according to Liquipedia, he went 0-7 not winning any matches at all. His big notable week was on september 28th where he went 5-1 defeating Mini, Soulkey, Best, Killer, Shuttle dropping his Ace to Larva. besides that, in more recent games he has been quiet and laddering/training.